The event takes place on the 23rd of June starting at 11.55. We warmly invite you to participate in a tape art workshop and create your own artwork out of tape. Everyone who is interested in creating something unique with a common utensil such as duct tape can participate. An artistic background is not necessarily needed. Experienced tape artists will support you in taping your own piece of art. 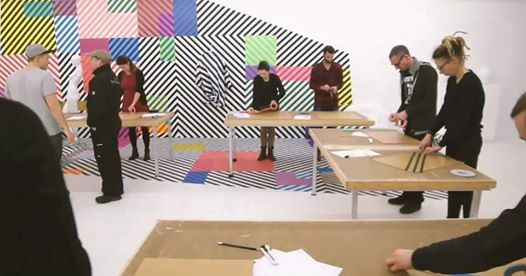 After a short introduction to tape art, different styles and techniques, we will start the workshop by using cutters, tapes and white wooden panels. At the end of the workshop, you can take it home, hang it or give it away as a present. There is no age limit, but children under 12 should be able to use a paper knife and accompanied by their parents. Tapeart is an art form in which tape or anything that „sticks“ is the main component. Tapeart is becoming more popular and has especially grown over the past years.